Caricom’s delegation to the United Nations on the troubles in Venezuela, has held final meetings. 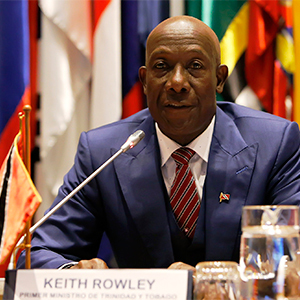 A statement from the Office of the Prime Minister last evening said the meetings established the need for dialogue in order to resolve the troubles in Venezuela. The statement said Dr. Keith Row­ley held a meet­ing with Am­bas­sador Jonathan Co­hen, who is the US rep­re­sen­ta­tive to the U.N, at the end of a round of New York meet­ings which Cari­com’s del­e­ga­tion held with officials. Dur­ing yes­ter­day’s Cari­com lob­by, the del­e­ga­tion, which in­clud­ed Cari­com Sec­re­tary Gener­al Ir­win Larocque and Trinidad and Tobago’s Am­bas­sador to the U.N Pen­ne­lope Beckles, met with the Pres­i­dent of the Unit­ed Na­tions. Af­ter that meet­ing, the del­e­ga­tion met with per­manent rep­re­sen­ta­tives to the UN from South Africa, Uraguay, Brazil, Aus­tralia and Nicaragua. The OPM said at the end of this round of Cari­com meet­ings, Trinidad and Tobago held a bi­lat­er­al meet­ing with Am­bas­sador Jonathan Co­hen, the US rep­re­sen­ta­tive to the UN. According to the statement, dur­ing the dis­cus­sion, trinidad and tobago, as part of the Caricom del­e­ga­tion out­lined its con­cerns about the volatil­i ty of the Venezue­lan sit­u­a­tion and the ex­is­ten­tial threat that it pos­es to the sta­bil­i­ty of the re­gion. Trinidad and Tobago al­so em­pha­sised the need for mean­ing­ful di­a­logue be­tween all parties in these mat­ters and reaf­firmed a com­mit­ment to work­ing through Cari­com and with all ex­ter­nal part­ners with­in and out­side of the re­gion.